As much as I love playing solo, collaborating with other people is a huge part of my musical life. If you’re interested in hiring me for a project, or have a collaboration to suggest, please do get in touch! 2015 – Steve Lawson – You Guys! Let’s Just Talk About Nail Varnish! 2008 -Lawson/Dodds/Wood – Numbers on Better Late records. 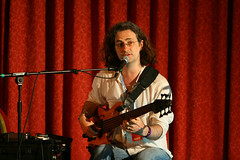 2007 – Luca Formentini; Tacet (bass and loopage on one tune), on Extreme Records. – Calamateur vs Steve Lawson; Calamateur vs Steve Lawson, on Autoclave Records. 2006 – Steve Lawson; Behind Every Word. – Steve Lawson; Lessons Learned From The Fairly Aged Felines. 2005 – Various Artists; European Bass Day 2004 – compilation CD, featuring tracks by John Lester, Lorenzo Feliciati, Jan-Olof Strandberg and others. 2004 – Steve Lawson; Grace And Gratitude. – Steve Lawson; Lessons Learned From An Aged Feline Pt II. 2003 – Steve Lawson; Jaco’s ‘Portrait Of Tracy‘, for Total Guitar Magazine, Bass Special. – Steve Lawson/Theo Travis; For The Love Of Open Spaces. – Steve Lawson/Theo Travis; It’s Not Gonna Happen. – Andrew Buckton; Rocket Ship on Blue Carpet Records. – Chris Bowater; Still on db studios. 2002 – Steve Lawson; Not Dancing For Chicken. – Steve Lawson/Jez Carr; Conversations. – Andrew Buckton; Now… But Not Yet on Bluecarpet Records. – Elrick Gold Series SLC 6 String fretted and fretless basses, Modulus Basses (6 string fretted and fretless and 4 string fretted), a Rick Turner 5 String Renaissance ‘Amplicoustic’ fretless bass, two Aguilar SL112 cabinets and 2 Aguilar Tonehammer 350 amp heads, A Jule Monique Preamp, the Looperlative LP1 for looping, Keith McMillen SoftStep controller and Quneo controller, MODDevices MOD Duo for processing, MXR, Darkglass, and Markbass overdrive pedals, a TC Electronics HOF mini Reverb and Flashback delay, Aguilar Overdrive, Fuzz, Compressor, Octave, Chorus, Filter and Preamp pedals, MXR Reverb, Sub Octave Bass Fuzz, Bass Distortion, Bass Chorus Deluxe, Bass Envelope Filter, Bass Preamp & Bass Fuzz Deluxe, Subdecay Vitruvian Mod ring modulator, Pedal Train pedal board an E-Bow+, Latch Lake and Dunlop slides, Dunlop Super Bright strings, East-UK preamps, Evidence Audio cables, GoGo tuners, 2 Korg Mini Kaoss Pad s and a MOTU Ultralite Mk III Hybrid. And I carry my basses around in SlickBag gig-bags. 1991 – AS Level Music, failed – fine at composition, not so hot on history… :o) Somehow got into music college in Perth, Scotland. Teaching as head of bass at West Lothian Rock School. 1993 – left college, moved to Lincoln, tour with Canadian singer/songwriter Johnny Markin. Gigs all over Europe, played on three albums. 1994-96 – working as a pro in Lincoln, teaching, studio and live session work. 1996 – moved to London, more session work, including TV, Radio and theatre work, more teaching. 1997-99 – teaching at Drumtech and Basstech, West London. 1997-2000 – freelance reviewer/interviewer/columnist/gadget guru for Bassist magazine in the UK. 1999 – Toured Europe with Howard Jones. First completely solo gigs in London. 2000 – Released And Nothing But The Bass on Pillow Mountain Records. More solo gigs around England. 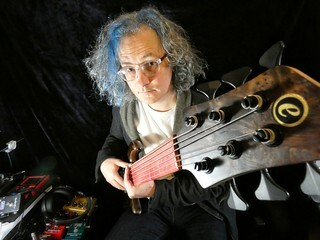 2001 – 2 Solo tours of California, including headlining the world’s first solo bass looping festival, and tour with Michael Manring and Rick Walker. Clinics for Ashdown Amps and Modulus Basses. Solo gigs in France. 2003 – four week solo tour of California, gigs with Michael Manring and David Friesen, including the Anaheim Bass Bash, featured interview in Euphoria magazine, and review of NDFC in Bass Player (Feb issue). New recordings with Theo Travis, BJ Cole and Patrick Wood for future release. Duo gigs with Theo Travis. Gig at the barbican with orphy robinson. Recording in France with Vigroux/Cury/Rives for upcoming release. first italian solo gig and recording session in august. Duo CD with Theo Travis – The Arts Show, alongside Jenny Eclair and Barry Cryer. Acclaimed appearances at The Detroit Bass Fest and European Bass Day. Gigs in US and UK with Muriel Anderson. A second tour in England with Michael Manring in November. 2005 – another year another NAMM show, followed by a few promo gigs with Michael Manring in California. Dates with pedal steel guitarist, BJ Cole, and recording and gigs with singer Cleveland Watkiss, as well as more UK dates, the Edinburgh Festival and a trip to Italy. Started monthly music night, Recycle Collective. 2006 – back to California, NAMM again and some more dates and another day-long masterclass, Recycle Collective continues to be one of the best live music nights out in London, and features musicians such as BJ Cole, Cleveland Watkiss, Orphy Robinson, Seb Rochford, Todd Reynolds, Jason Yarde, Andy Hamill, Patrick Wood, Leo Abrahams, Julie McKee, Andrea Hazell. UK tours with Theo Travis, Muriel Anderson and Ned Evett. 4th solo album, Behind Every Word, released on Pillow Mountain Records. Recording in Italy with guitarist Luca Formentini. New duo formed with singer Julie McKee, for the Edinburgh Fringe. European tour in October, including EuroBass Day and European Bass Day, as well as an electronica festival in Italy. Behind Every Word makes a number of end of year ‘best of 2006’ lists. 2007 – guess where it started? Yay, NAMM!! Bass-Bash, two days of masterclasses, Modulus clinics and gigs both solo and with Muriel Anderson and Vicki Genfan. Much fun. First New York show too. European tour with Lobelia, including first time visit to Frankfurt Musik Messe and gigs in Italy, Spain, Germany and Denmark, 7 week tour of the US, 24 states, 7000 miles. Gigs at Greenbelt festival with Lobelia, Sarah Masen and Ric Hordinski. Recycle Collective relaunched in September. Playing on one track on Luca Formentini’s album, Tacet. First Amsterdam and Geneva gigs in November. Released live EP with Lobelia in December. Recorded improv album with Patrick Wood and Roy Dodds. 2008 – NAMM again, with Lobelia this time, playing the bass-bash and for Looperlative and Modulus. More California shows. Back to England, playing lots of ‘acoustic’ shows with Lobelia, London Solo Bass Night in March with Todd Johnson and Yolanda Charles, . Year ended with Lawson/Wood/Dodds album ‘Numbers’ released, and some LDW gig dates round London, followed by a whole string of house concert shows in England and the US with Lobelia. 2008 was also the year of social media – 10 years of running my music career online turning into a 2nd career teaching and consulting on how it all works, including Nokia flying me to Helsinki for their Open Lab, and working on the launch of Ucreative.tv at UCA in Rochester. Finished the year with a series of house concerts in the UK and the US with Lobelia..
2009 – …which continued into the new year on a trip that included a trip to NAMM, a masterclass at Duquesne University in Pittsburgh and a series of masterclasses in bass, looping and ‘social media for musicians’ in various people’s houses. But I did miss the bass-bash for the first time ever. Back to the UK for more bass masterclasses and other University-based projects around the future of the internet… look out for a new solo album at some point this year! 2010 – the first half was spent looking after our new born baby, but at the age of 6 months, we took him to the US for a 7 week, 6500 mile tour of house concerts, that took us from Brooklyn to Milwaukee, Massachusetts to Lake Charles Louisiana, via Texas, Tennessee and Ohio. Lo and I recorded a live album on the tour, featuring Todd Reynolds and Neil Alexander, and while in Louisiana I recorded TWO duo albums with Trip Wamsley, released in September. The end of the year featured a sold out London gig with Michael Manring, and speaking engagements in the UK and Berlin at grass roots music industry conferences. I also released another live album, celebrating the 10th anniversary of my debut album coming out. 2011 – first half of the year was focussed on getting my first new studio album in 5 years finished. 11 Reasons Why 3 Is Greater Than Everything was released and followed by a 2 month, 8000 mile US tour, which included shows with Julie Slick, Trip Wamsley, Tiger Darrow, Steven Guerrero, Darren Michaels, Neil Alexander, Trevor Exter and Catherine Marie Charlton. The trip also included me guest-performing at Victor Wooten’s Music-Nature Camp, teaching a bass masterclass in Virginia, and Lobelia and I being the only overseas musicians to be booked to play at the first Wild Goose festival. Oh, and I also co-produced, mixed and mastered Lobelia’s new record, Beautifully Undone. We started selling our music on USB Stick, which has proved v. popular. A move to Birmingham in the late summer promises all kinds of new opportunities. 2012 – the year started with the release of Believe In Peace, an all-improv solo record, recorded in Minneapolis. January continued with a return visit to NAMM, 12 shows in 12 days including duo shows with Julie Slick, Michael Manring and Daniel Berkman, a recording session with Steve Uccello and a playing-and-speaking gig at Stanford uni, as well as a masterclass at LA Music Academy. The shows with Julie, Michael and Daniel were all recorded, so mixing and mastering work on those took up a lot of the following months, as well as recording for Californian singer/songwriter Artemis. May saw the relaunch of Beyond Bass Camp, and the remastering of 11 Reasons… 2012 also saw the formation of #ToryCore – a project that coupled the evil words of the Tory govt with twisted avant garde metal. One of my favourite ever musical projects. 2013 – started with NAMM and another 8 shows with Daniel Berkman, and this time Artemis joined us on vocals at every gig. It was one of the most amazing musical experiences of my life to play with them both. Which is why a large chunk of the year was taken up mixing, mastering and releasing EVERY show we’d done up to that point. All 10 of ‘em. Went out to Frankfurt to the Musikmesse, more ToryCore shows & a few more gigs with Alvin Stardust depping for his regular bassist. Started teaching at Kidderminster College, and ended the year with a lovely joint tour with one of my favourite bassists – Yolanda Charles, and with a duo show with Andy Edwards on drums. 2015 – NAMM in January, of course, plus a handful of lovely house concert shows with guitar genius Thomas Leeb. Released LEY Lines with Andy Edwards and Phi Yaan-Zek, the first new thing that my subscribers got, which Phi released for everyone else. Did the London Bass Guitar Show again, and had another of my bass heroes Ruth Goller agree to play with me. That was fun. Formed a duo with Divinity Roxx – hip hop, improv, songs, stories, all rolled in. We had a week of playing and did a first gig in Kidderminster. The duo with Jon Thorne was expanded to a trio with Rob Turner, of GoGo Penguin, that band sounds amazing! In September, I release two new solo albums – my first proper solo album releases since 11 Reasons in 2011. A Crack Where The Light Gets In and The Way Home were really well recieved, and got played on Late Junction. In October, I was the cover star on Bass Guitar Magazine, almost certainly the only self-managed, self-releasing, self-everything solo bassist to ever get there without an association with any other artist. Still can’t quite believe it. The mag cover coincided with a mini-tour with Jonas Hellborg – we had a wonderful time playing in Birmingham, London and Leeds, and hope to do a bigger tour ASAP. By the end of the year, I’d released 7 albums for Subscribers, all of which I’m immensely proud of! The year ended with the recording of a second album with Phi and Andy, to be released early in 2016. The year also featured a few more Torycore gigs – a thing that gets better every time we do it, and more vital, sadly. Solo gigs and recording -::- Duo with Divinity -::- trio with Jon Thorne and Rob Turner -::- trio with Andy Edwards and Phi Yaan-Zek -::- performance duo with painter Poppy Porter -::- Torycore. 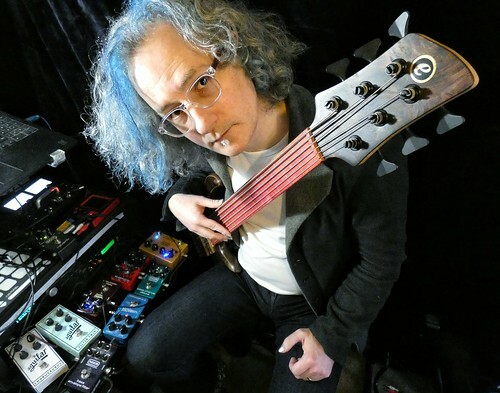 bass influences – Current favourites are Tony Levin, Ruth Goller, Michael Manring, Julie Slick and Matthew Garrison but there are literally hundreds. I suppose, in roughly chronological order, those players that have influenced me the most would be – John Taylor (Duran), Nick Beggs (Kajagoogoo/Iona), Chris Squire (Yes), Simon Gallup (The Cure), Pino Pallidino (everyone, but especially the D’Angelo stuff), Doug Pinnick (King’s X), Ewan Vernal (Deacon Blue), Steve Swallow, Abraham Laboriel, Jaco Pastorius, Scott LaFaro, Freddie Washington, Bernard Edwards (Chic), Ray Brown, Jonas Hellborg, Family Man Barratt (The Wailers), Verdine White (EW & F), Tommy Simms, Niels-Henning Orsted Pedersen, Jimmy Haslip, Danny Thompson, Eberhard Weber, Mike Rivard, Marc Johnson, Kermitt Driscoll, Mo Foster, Todd Johnson, Doug Wimbish, Yolanda Charles, Trip Wamsley, Divinity, and loads more. The second track is an improv duet with Cleveland Watkiss, the first thing we ever played together, and has a sort of Gregorian chant-ish harmony to it. Track three is with Theo Travis, and is an improv track from a gig we did in Cambridge, that will eventually end up on a live album somewhere! The last track features Cleveland again, and Julie McKee – all good stuff! So head over there, enjoy, and look out for more RC gigs coming up soon! It took Lo. and i ages to get to the venue, thanks to nasty south London traffic, but we’d left plenty of time, so no panic. When we got there, Cleveland was already setting up, Sarda and Kari were downstairs, Oli was sorting out the venue, and all was familiar. We set up, and just listening to Cleveland soundcheck made me realise how much I’ve missed hearing him perform in the last 9 months – for all of 2006, he was doing the Recycle Collective every 2 or 3 months, so I got to both listen to and perform with him a lot. He’s definitely one of my favourite solo looping performers anywhere, and he gets more proficient with the technology every time I see him play. So the gig itself started with me solo, with a couple of improvs, including the now-fairly-regular one based on Bach’s Cello Suite #1 in G, and then I got Andrea Hazell up, for a big sprawling open ambient piece – Andrea’s voice lends a gravitas to everything she sings on, as noted before. Lovely stuff. We then finished off the first half with some trio improvs, some cool funky stuff with Cleveland beatboxing, and some more spacey ambient things. Second half started with Cleveland on his own, but he very quickly got Andrea up to join him, and their duo segment was really really wonderful – their voices combine so well, and the juxtaposition of his funkiness and her operatic poise was beautiful. I really hope we get to hear more of that! Cleveland invited me back up, and we went into more funky, spacey territory with Cleveland launching into a tune from Carmen, which he and Andrea then played around with for a while which was both marvellous and hilarious, especially when Cleveland went into a patois/ragamuffin version – really magic stuff! And to finish the night, I got Lo. up to sing with us, and she improvised a really gorgeous sound, that Cleveland added harmonies to, and the three of them stacked vocals for a big ambient ending. Lovely lovely music. It was really lovely to play the vortex, though with the venue shift and the big break from the last show to this one, the audience numbers were down on our Darbucka averages… We should be back with a Darbucka show in October – watch this space, I’ll be booking it ASAP! That’s rather nice, and true, and means you shouldn’t miss it! Anyway, we got there thursday evening, set up the tent. Friday was spent catching up with friends and getting ready for the first gig of the weekend that both Lo. and I were playing at – a mainstage set with Sarah Masen. The first nice surprise was how well bands are looked after on mainstage – lots of lovely roadies and stage managers sorting everything out. Good peoples. The set went really well – was a whole lot of fun, and the crowd was HUGE for a first-band-on. Sarah sang beautifully. All good nothing bad. The best thing about that was that we then had the rest of the night off, and were able to see a bit of Over The Rhine, and then all of Billy Bragg’s set. He was, as expected, outstanding. Funny, engaging, moving, all good things. Couple of great new songs, fab versions of old songs. He just confirmed why he’s one of my favourite live acts in the whole world, and one of my favourite guitarists too. After that much mellowness ensued, hanging with friends, eating lovely food, until it was time to get ready for a busy evening, firstly my gig with Ric Hordinski and then the Recycle Collective. Always a highlight of Greenbelt for me, the RC gig was a blinder, featuring me, Lo, Ric, Andrea Hazell and Patrick Wood. Much lovely music followed, and Patrick in particular was on incredible form. A real triumph. Sunday was meant to be my mellow day, but after the previous night’s gig, Ric asked if I’d play with him again in the Performance Cafe, and I’m v. glad I did, as it was probably the best gig we did – we rocked! Great reaction from the Performance Cafe crowd too. After that I was supposed to be compering but managed to delegate and get some time off for buying fairtrade shoes and hanging out with lovelies again. Got to see Sarah Masen play solo in the Perf. Cafe (aside from a couple of song with the lovely lady vocalistes) and she sounded great, as did Emily Barker who was on before her. Late nights at GB are spent in the Organic Beer Tent – friendships are made, beer is drunk and the world is put right. Monday was back to more gigs – I was compering in the Perf. Cafe, and got to introduce one of my highlights of the weekend – Nizar Al-Issa (though I got his name wrong on the intro – sorry, Nizar!) – he’s a singer and oud player, and a really great musician. Beautiful haunting music. After him was Lo and I doing our main duo gig, playing to a nice full tent of peoples, and we played pretty well. Lo’s piano songs being especially great. after that I got to see another one of my highlights – Beth Rowley, a fantastic singer with an amazing band (it helps that her guitarist and drummer, paul and phil wilkinson are two of my favouritest musicians anywhere). Really great stuff. the evening was spent watching first Iain Archer, then Duke Special on the mainstage – both long time faves of mine, and both on fine form, playing to a huge crowd who loved them muchly. The headliners on the night were of no interest to me, so we headed for the beer tent. After being there an hour, Lo and I got a call asking us to go and play the late night cabaret (playing to about 1500 people)… after 2 pints… hmmm, we did it, and pulled it off. ‘Twas a little ragged, but fine. And thus ended another great greenbelt. Now it’s time to buy a load of the talks I missed as downloads. All kinds of exciting gig booking news today – first up, on August 22nd, I’ll be back playing at Darbucka for the first time this year, in my duo with Lobelia and also with Monk aka Ric Hordinski – Ric is a stunning guitarist, a former member of Over The Rhine, has produced records for people like Phil Keaggy and David Wilcox and made a stack of amazing records under the Monk moniker. I played a show with Ric in LA a few years ago that was a whole lot of fun, and a whole lot of great music, and I tracked some fun noises for his new instrumental record when I was in Cincinnati on this last tour in the US. The duo with Lobelia is one of the most exciting and fun musical projects I’ve had in ages, and you can hear some of what that sounds like on my myspace page and on her myspace page too. Also this evening I’ve booked Patrick Wood and Andrea Hazell to come and play with the Recycle Collective at Greenbelt – both are Recycle regulars, stunning improvisors and just all-round amazing musicians. AND, as if that wasn’t enough, I’ve booked Andrea, and am just waiting for confirmation from Cleveland Watkiss for the Recycle gig on the 6th September at The Vortex – how exciting! Go and put them in your diaries now, you lovely london peoples. Fab gig last night. Got there nice and early to set up, so was v. relaxed. Just as well, as i’m not well at all, so couldn’t have dealt with getting there late and rushing to set up. Catster turned up to do the door (TSP taking a well-earned night off), Cleveland and Huw sauntered in not long after 7, got set up, all good nothing bad. And people started arriving. Lovely people, just the kind of people I wanted to see. Greenbelt people, forum people, Danes, students, poets, singers, guitarists, Orphys (what is Orphy? Clearly ‘percussionist’ is way too limiting for what he gets up to these days… :o) )… A really lovely attentive friendly audience. I started, as is customary. First tune was a cover of a lovely song by a fantastic Canadian singer called Lobelia, who I’m going to be recording with v. soon (the wonders of MySpace) – a lovely song called Happy that while I was playing along with it to get a feel for how she plays, revealed itself to be perfect solo-version fodder. Bit of a looperlative glitch, but I know it well enough to get round those things now. Followed that with Scott Peck, then got Cleveland up, then Huw. The middle piece with Cleveland and Huw is one of the loveliest bits of improvised music I’ve ever played. Started out with a bit ambient mush thing from me drifting through loads of clashing tonalities, before settling in one place, Huw joined in, and Cleveland improvised an exquisite lyric. Food for the soul. Onto Huw’s set, which started with a John Dowland piece, on Nord Electra… which worked. Beautifully. Another solo set of African variations from Huw, then he and I played a particularly dark electronic spikey piece (and fell about laughing at just how twisted it all got), before Cleveland joined us again for more trio fun. Set three began with two tunes by the wonderful Gary Dunne – a great singer/songwriter/looper/house-concert-legend. Perfect Recycle material. He’s great, go and check him out. Then onto Cleveland’s set. His Echoplex had died, but I’d brought mine as a spare so we plugged that up and away he went, including his amazing solo voice arrangement of a Chopin Prelude. Wow. Cleveland and Huw’s duo section was really lovely, with Cleveland singing walking bass and beatboxing at the same time through much of it. Really great stuff. And onto the final act of this birthday celeb. A huge mega piece which started with Huw, Cleveland and I, with me looping both of them, then we were joined by Roger Goula, then Patrick Wood, then Orphy Robinson, then Andrea Hazell – the two guitars and trumpet were woven into this huge busy sound, which as Andrea joined me, I cross faded back into just the ambience of her unbelieveable voice and my massive reverb and delay bass part. A perfect touchdown. Particularly nice to have Patrick and Andrea there, as they were part of the first ever unofficial RC gig, before it was the RC at Greenbelt 2005. Paul Powell’s Liquid Lunch, with Jude Simpson, Gareth Higgins and Cole Moreton. All four of the me-playing moments went really well, so can’t pick favourites there, and everyone I got to play with over the weekend – Julie McKee, Steve Stockman, Simon Jones, Mark..? (fab poet whose surname I didn’t catch, sadly), Huw Warren, Andrea Hazell, Harry Napier, Juliet Turner… were all fab. The poetry and bass stuff (Stocki, Simon Jones (‘is unwell’) and Mark) was a whole lot of abstract fun, and the Recycle gig continued the tradition of Recycle gigs resulting in some of the loveliest music I can imagine. All good, nothing bad. Greenbelt really is my favourite weekend of the year, and selling lots of CDs and T-shirts is kind of a lovely icing on the cake. It speaks volumes that I took no photos at all over the weekend – was far too busy having fun to faff with a camera. But there are squillions of great photos on the Greenbelt website. If you weren’t there, put the last weekend in August in your diary for next year now. It’s magic. The last day of GB was a fab one – starting with an organic vegan breakfast, and progressing via a panel discussion on Norther Ireland featuring Assembly members from the DUP and Sinn Fein along with two peace activists, one of whom had had his wife murdered by the IRA. The session was incredible, and what was said was so remarkable, that I doubt they’ll release the tape of the session… A big step forward. Maximum kudos to the most wonderful Gareth Higgins| for chairing the session so well. After that, I was back into compere mode, to introduce Lleuwen Steffan, Huw Warren and Owen Evans – definitely one of my musical highlights of the festival (that’s their gig, not my introduction, which was good, but hardly a highlight). Amazing music, great performance, very well received. After that it was full-on Recycle gig logistics – collecting keyboards for Huw to play, getting my gear up to the venue, missing lots of things I really wanted to see… Anyway, got all the gear up to the venue, and set up. Lovely audience comes in along with my co-conspirators. The gig started with a me-solo set – (Grace and Gratitude, Behind Every Word, MMFSOG, Scott Peck, FRHU, Deep Deep Down and Deeper Still, for those keeping notes), then Julie joined me for some New Standard-ing – Video Killed The Radio Star, I Don’t Wanna Know and Running Up That Hill. Then we went into One Step from the album, and about three quarters of the way through, I gave Huw a nod and he joined in on the baby grand piano that was in the corner of the room, which worked an absolute treat. After that, he came up to the stage on Keys and laptop, and he Julie and I did a couple of improv things, with them doing a duo version of ‘The Water Is Wide’ in the middle that was exquisite. All change after that, and Andrea Hazell joined in on voice for our version of Dido’s Lament, which was gorgeous as always. The wonderful Juliet Turner then got her first taste of Recycling with Harry Napier and I. Most lovely. And finally, Huw and I played a gentle duet to send the lovely crowd off into the night. All in all, a fab Recycle night. Don’t miss Sept 20th at Darbucka! Then it was all systems go to get all the stuff packed up before Spearhead started on mainstage. We missed the very beginning of the set, but it must be said that standing in a field at Greenbelt with TSP listening to Spearhead is as close to utter bliss as I can imagine. Really really great way to end a stunning weekend of great music, me-gigs, new friends, old friends, brain food, organic food, camping, chatting, hugging and kissing, laughing, sharing etc. etc. etc. All good nothing bad. Everything was wonderful in this best of all possible worlds.